We are just a month from the show in Estes Park. The next couple of work sessions will be focused on getting us ready for the show in Colorado Springs and this show. Remind for those going to get your hotel reservations in as soon as possible. The Rails in the Rockies show is a premier model railroad show event developed and hosted by the Estes Valley Model Railroaders in Estes Park, Colorado. It takes place on President’s Day weekend in February. This will be our 18th appearance in the 22 history of the show. The show is at the Stanley Fairgrounds on the east side of Estes Park on Highway 36 as you pass the lake. The address is 1125 Rooftop Way, Estes Park, 80517. Turn off 36 at the Estes Park Museum onto Fourth Street. We are in the Estes Park Event Center which is the large building in front of the show venue last year. Set up times will begin at Noon on Friday, February 15. We have set up time through 8:00PM on Friday evening. Set up time is also available at 7:30AM Saturday, February 16. The Show opens at 9:00AM. Saturday 9 – 5 and Sunday 9 – 4. Watch for Club Members helping in the parking lot. Club members and others will be available to help you unload. There will be dedicated parking for us and the trailer on the east side of the building or in the parking lot by the grandstand. There are two overhead doors, one on the east side and one on the north side, which will be available on a first come, first serve basis. There are many regular doors around the building. The table/display placement is to comply with the Estes Park Fire Code and Safety Regulations and provide better traffic flow. Please do not move from your assigned locations without permission from Laura Trump. There will be food available in the show area, but they are only able to take cash. No credit cards or checks. There is an ATM available at the show in the lobby by the ticket table. The Show closes at 4:00PM on Sunday. 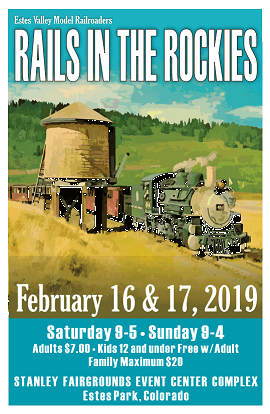 Rails in the Rockies 2019….Always on President’s Day Weekend in February!